Health and fitness is the best solution to a longer and quality life. What better way to achieve this then to start on an exercise regiment that is both fun and rewarding. Villari’s offer classes for children and adults. Our classes teach the key elements for success applicable to academic, personal and professional arenas. We offer fitness and wellness programs as well as specialty classes in leadership training, stress/pain management, and life skills coaching for improved productivity. 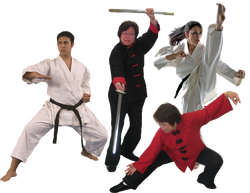 Our style is an intergrated system extracting the best parts from Shaolin Kung Fu, Karate, and Kempo. Our Tai Chi classes provide health benefits to reduce stress, manage pain, increase flexibility and range of motion, and strengthens the immune system. To provide every man, woman and child with the highest quality of martial arts training, so that they become empowered to live richer, more rewarding and meaningful lives, and in so doing, contribute to a stronger community. Click on the Announcement Note above for the latest news, events, holiday closings and specials being offered. 2. Schedule your first visit. ​ 1. Press the Button above.